Following numerous requests from customers, Toradex has announced the availability of a further member of the Colibri Embedded Computer System on Module family. The Colibri T20 256MB IT V1.2a, based on the NVIDIA® Tegra™ 2 ARM® Cortex A9 MPCORE dual core processor, is a lower cost, industrial temperature range module. 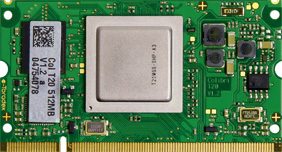 Colibri modules feature state of the art NVIDIA Tegra 2 technology and are aimed at low power systems that require high CPU and/or graphics performance. Colibri modules are standardized, highly miniaturized and encapsulate complex hardware and software for fast and easy product development. Toradex® is a registered trademark of Montadex GmbH. NVIDIA® and Tegra™ 2 are trademarks or registered trademarks of NVIDIA Corporation in the U.S. and other countries. ARM® is a registered trademark of ARM Ltd or its subsidiaries.